Russell Napier: The Rising Dollar Will Trigger The Next "Systemic Banking Crisis"
Fresh off his successful call earlier this year that the US dollar would strengthen in the coming months, macroeconomic strategist and market historian Russell Napier joined MacroVoices host Erik Townsend to discuss why he favors deflation and why he has such a bullish view on the US dollar. Echoing David Tepper's concerns that the equity highs for the year might already be in, and that a 10-year yield above 3.25% could lead to market chaos, Napier said he sees interest rates rising sharply in the coming months as the dollar strengthens - a phenomenon that will push the US back into deflation. Napier's thesis relies on one simple fact: With the Fed and foreign buyers pulling back, who will step into the breach and buy Treasurys? The answer is - unfortunately for anybody who borrows in dollars - nobody. In fact, the Fed is expected to allow $228 billion in Treasury debt to roll off its balance sheet this year. This "net sell" will inevitably lead to higher interest rates in the US, as well as a stronger dollar. And once the 10-year yield reaches the 4% area, signs of stress that could be a lead up to a global "credit crisis" could start to appear. We know what the Federal Reserve plans to sell this calendar year, $228 billion. We know what the rise in global foreign reserves is, and about 64% of that will flow into the United States’ assets. Slightly less of that will flow into Treasuries. 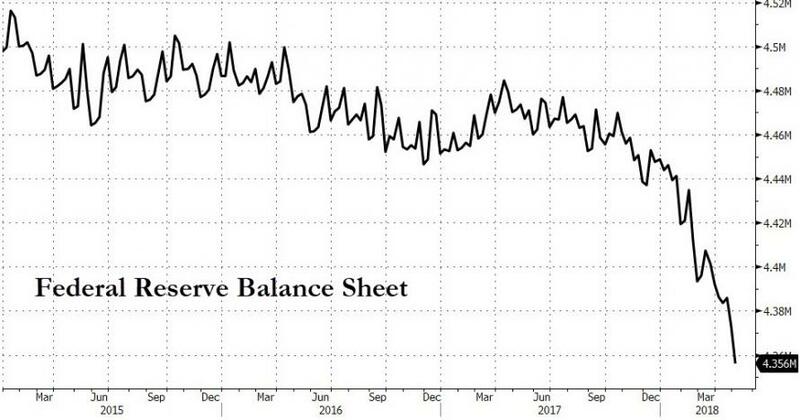 $228 billion, at the current rate at which foreign reserves are accumulating, we are not going to see foreign central bankers offsetting the sales from the Fed. So that’s a net sell. We don’t know what that net sale will be, but it’s a net sale from central bankers at a time when the Congressional Budget Office forecasts a roughly $1 trillion fiscal deficit. This is the first time in my investment career that savers will have to fund the whole lot. And it’s perfectly normal that real rates of interest have to go higher to attract those savings. $1 trillion is still a large amount of money. It can come from anywhere in the world. It can come from outside the United States. It can come from inside the United States. But it’s a liquidation of other assets or a rise in the savings rate, which is necessary to fund this. Either of these things is positive for the dollar. And that's a huge problem - not for the US so much as the rest of the world, where higher US interest rates could lead to a global credit crisis which Napier believes could begin in China or Turkey, then emanate out from there. One symptom of the rising dollar, Napier says, is it could force China into a corner and finally help China bears like Kyle Bass who have countenanced brutal losses over the past couple years as the greenback as weakened. While Bass has cut back some of his positions, he says he remains committed long-term to his bearish thesis. So the strong dollar, if it continues and if it comes to pass, really could force China into a corner. That, combined with the trade tariff policies of the president, may be leading us to a more flexible exchange rate. Or at least what will be billed as a more flexible exchange rate but, for all intents and purposes, is likely to be a weaker Chinese exchange rate. So I was just going to read you the list of those emerging market economies where the debt-to- GDP ratio has been going so strongly that actually the BIS suggests there is a risk of a systemic banking crisis. China is top of the list; you’re absolutely right to point to China. I think there is definitely a role already being played by higher US rates. So if the dollar goes higher as well, it’s definitely playing a role in creating vulnerabilities. We’ve seen a couple of large Chinese companies unable to pay their US dollar credit. As I’ve mentioned, there’s a lot of Turkish companies that really can’t pay it. And that is already something to do with the rise in US yields. They’ve gone from incredibly low levels to low levels. But it’s enough at the margin when global debt to GDP is to shine the light on particularly vulnerable economies and particularly vulnerable companies. A strong dollar should be negative for global equities, Napier said. But the outlook for European and EM equities would be far worse than the outlook for the dollar if US interest rates climb above 4%. So all I would add – let’s say I’m wrong on US rates and these yields continue to rise, I think that’s particularly bearish for those outside of America who borrowed dollars, people we’ve already focused on. I think United States growth may be good. United States inflation may be rising. I wouldn’t specifically see any particularly bad credit issues in America. I don’t see it being anything like we’ve seen in the past. But outside of America, I think there would be an awful lot of pain going on as interest rates go higher and higher and higher. Remembering that, roughly, the European banks – I should say non-US global banks – have got a loan book in dollars of about 4.5 trillion. That’s a big loan book for people who don’t really take US dollar deposits. And the implications of higher US rates and a higher dollar mean that the pain may not be so America specific, but it could be very emerging market specific.